Before moving on with our story of Jesus' life on earth, I stopped to talk a little about the dual nature of Christ, who was 100% man and 100% God. We talked about how this is a mystery. We talked about other mysteries in our doctrines - the Trinity, one God in three Persons, or the Lord's Supper, where we partake of Christ's body and blood even if His body is in Heaven. Then we talked about heretics. A heretic is someone who claims to follow a religion but teaches something different. I explained how some people tried to explain the dual nature of Christ by saying that he was really a man with just a lot of God's spirit in him. Others said that he was really God but looked like a man. Those are both heresies because it's very clear in the Bible that Christ was both God and man. Justin asked why anyone would teach something that is not in the Bible. I told him that usually this happens when human beings try to explain some biblical teachings that God didn't mean for us to understand fully. We know that Christ was fully man and fully God but we don't know how and we don't need to know. We saw how God's plan of salvation not a mystery because that's something that we need to know. We also saw how all heresies about Christ's nature are harmful to our understanding of salvation. If Christ was only a man (with a lot of God's spirit him him), he was born with the original sin and could not save us. If Christ was only God (but looked like a man), then he could not save us because only a man who had lived a perfect life could die for the sins of other men. We saw that a clear understanding of the two natures of Christ is important when we read about Jesus' early years on this earth. As a man, there were things that he didn't know. He was not born with the knowledge of how to walk, feed himself, or go potty. That's why he grew in stature and wisdom. We talked about how he was not like Superman in the original movie, picking up trucks (or, in Jesus' time, camels) and being surprised at his own strength. Jesus never used his powers unless it was to accompany a special revelation. At the same time, as God, Jesus knew and understood many things that men didn't understand. That's why he amazed the doctors of the Law in the temple. And, as he explained to his parents in that occasion, he was fully aware of His mission on earth. In Luke 2, we read that his parents didn't understand what he said, although Mary treasured those things in her heart (as she did after Simeon's prophecy in the temple). We talked about how living with his sinful parents was for Jesus another part of his humiliation and even suffering. We read that after he amazed the doctors of the Law in the temple, he returned submissively with his parents to Nazareth. If there was ever a teenager who knew more than his parents, it was Jesus! Without a doubt, he must have suffered unjustly when they lost their temper (as I am sure they did at times, being sinful). Even worse, he knew the full weight of their sins in the eyes of a perfect God. But he submitted. His sufferings started at his birth. We read about the wise men who came from the East. We don't know if they were three. The Bible just says "wise men". We learned that they must have felt very excited as they followed the star to the place where the "King of the Jews" was born. They knew he was supposed to be a very special king. How disappointed they must have been to find out that no one knew about his birth, not even Herod, the present king. When Herod found out from the chief priests and scribes that a king was really supposed to be born in Bethlehem, he was "troubled". He didn't want this special king to take his place! We learned that in those days God sometimes gave revelations to all, Jews and non-Jews. Many years before, when Abraham, fearing for his life, told everyone in Egypt that his beautiful wife Sarah was his sister, God spoke to Pharaoh in a dream telling him not to take her as his wife. In this case, God led the wise men by a star to the place where Jesus was born, and then he warned them in a dream not to return to Herod. Next week we will see what Herod did. For memorization, we are learning question 60 from the Heidelberg Catechism. Today we read the story of Simeon and Anna in the Temple. We reviewed the expectations of the Jews at that time regarding the Messiah. Most people expected a mighty king who would deliver them from the Romans. Simeon and Anna had the right expectations, which were based on all the Scriptures and not only on a few passages. We also talked about Jesus' humiliation in His earthly life, and how suffering precedes glory. According to the dictionary, humiliation means to "reduce to a lower position in one's eyes". Everything in this earthly life was pretty humiliating for the King of Kings! Finally, we noticed Simeon's prophecy about the Gentiles. Jesus was going to be a light to the Gentiles and a glory to Israel. I decided to see where the word Gentiles comes from. It comes from the Latin gentes, which means peoples or nations (the Greek word is ethnos, from which we get our words "ethnic" or "ethnicity"). So Simeon was saying that Jesus came to be a light to the nations in general. The Jews used this word to mean the nations which were not Israel. The majority of us in our Sunday School class are not of Jewish descent, so thank God that His light went out to the Gentiles! Since one of you thought that Gentiles meant "white Christians", I am enclosing a picture of a painting done in Egypt around the time of Jesus. We have gone through the stories of Zechariah and Elizabeth, and of Joseph and Mary. We have followed on the map Mary's trip from Nazareth to Judea and back, and Joseph and Mary's trip from Nazareth to Bethlehem. We have learned that Bethlehem, Nazareth, and Jerusalem are cities, and Galilee and Judea are regions. Part of Mary's trips was probably through dry and sandy areas like you see in this picture. We have stopped after the shepherds had just spread the news of the angels' proclamation and the birth of Jesus. We read that "Mary treasured up all these things, pondering them in her heart". The word translated "treasured up" also means "collect, put together". Mary put all these things together in her mind, thinking about the glory of her newborn son, God's Son. We learned how the word "pondering" means "thinking deeply". We decided to ponder about all this too. Next week, we will read Luke 2:22-36 and maybe start Matthew 2 (the wise men), depending on the time. All those who have memorized Questions 1, 2, and 21 from the Heidelberg Catechism should memorize Question 60. Have a great week and write some comments if you like! This is not as bright as the map we have in our classroom, but it's free and can help you while you are at home to find the places we mention in our class. Zacharias and Elizabeth lived in Judea and Joseph and Mary lived in Galilee. These are some of our students (some were absent). Back row: Tiffany, Genny, Mikaela L., Madison, Anika. Front row: Mikaela P., Justin, Isaac, Seth, Renaissance. I will try to update the photo when everyone is present! As I was thinking of a name for this blog, I knew what I didn't want. I didn't want some little-league soccer names like "Light Sparks", "Pop-Tarts", or some pseudo-biblical version of these. which is in turn taken from Dorothy Sayer's The Lost Tools of Learning. Dr. Clark says, "In the 'pert' stage (circa ages 9-12), children begin to analyze the raw data which they have memorized. Because they lack emotional maturity, the questions may be expressed rudely (hence 'pert'), but in fact questions about the faith show that children are trying to make sense for themselves of what they have been taught. If properly catechized, children now have something interesting to discuss at Sabbath lunch, especially in the pert stage. They will also ask questions just before bed such as, 'Daddy, how can God be one in three persons?' This will be a good stimulus for parents to learn the catechism for themselves!" About the "poet" stage, he says, "In the 'poet' stage (circa ages 12-14), children begin to apprehend that there is more to reality than what they can taste, touch, see, smell and hear They begin to learn how to express themselves more appropriately and to appreciate the finer things in life. Much more importantly, however, if we begin catechizing our children early enough, by the time they reach this stage, we can expect them to begin to 'discern the body' (1 Corinthians 11:29), to be ready for profession of faith, to take up the covenant for themselves and to be ready to be fed by Christ's body and blood with Christ's congregation. If we catechize our children early on, by the grace of the Spirit, they are able to develop their powers of doctrinal discernment, which they will certainly need." 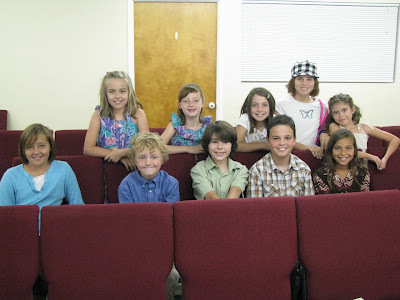 Most of the children in our group have taken the pre-profession class with Pastor Brown, some have made profession of faith and some are scheduled to do so very soon. I would say that they are already in the "poet" stage! Because their emotional maturity is still developing, we have chosen (in counsel) the name "pre-poets".